Will Counterbalance Forklift Licence Cover Driving Reach Truck? - Be Certified Today! Will A Counterbalance Forklift Licence Covers Driving a Reach Truck? You might have read many myths about driving the counterbalance forklifts. You might also hear that it is just like driving a vehicle with automatic transmission, so you think you can drive one, this is when untoward incident and fatal accident happen. Driving forklift is very dangerous undertaking, if you do not know what you are doing, stay away from the forklift, get trained first. Many beginners in the field of forklift operation have a misconception that a counterbalance forklift licence can cover reach truck and other types of counterbalance truck. This is not TRUE. That belief could get you into trouble. Basically, the reason why it is not true is because counterbalance and reach truck are two different type of lifts that have their own distinct operational controls and functions. If you are already trained to operate counterbalance truck and if you are tasked to perform job using reach truck, you have to be trained first in a specific course for reach truck. You need to take conversion course for you to enable to operate both the counterbalance forklift and reach truck. Now, the other question still remains that make people also confused, and here it is. Does a Counterbalance Licence Cover All Sizes of Counterbalance Trucks? Again, training course has to be very specific to the category of forklift that you will be operating in your place of work. Even if you have counterbalance forklift license in 5-tonne machine and you want to drive heavier capacity truck, you still have to undergo training specific to that truck. Counterbalance forklifts differ in weight, capacity and type of tires, you have to learn those specifics and you still have to take conversion training course. Like for example, ITSSAR, this accrediting body has three various size groups for counterbalance trucks. These groups are: 5 tonne and below; 5 tonne up to 15 tonne and over 15 tonne. If you want to be certified for all of those three categories, you need to take a conversion course to be able to drive all those counterbalance forklifts. 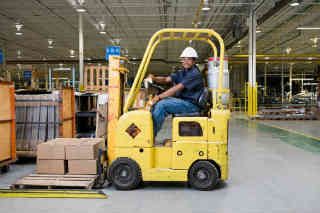 Counterbalance forklift is the most common truck we see, this is what comes into our mind when we think of a forklift. Due to its different varieties in terms of number and size of wheels, load capacity and fueling systems, counterbalance is the most flexible type of forklift. You can use it anywhere from tight spaces to rough and uneven terrain. You can power it with gas, PLG, diesel and it could be electric. Counterbalance can be installed with attachments to make it suitable for the required job and work condition. On the other hand, a reach truck is versatile in the functions it is aimed to perform. It offers maximum height lifting capacity as its name implies. This feature makes it very ideal for warehousing. With its long legs, it can reach to the racking system with the height of 15 feet and further and operate in a very tiny corridors and spaces. Unlike the counterbalance where you can operate it indoor or even outdoor, reach truck can only be operated indoor and cannot be driven in uneven floor surfaces. Forklift training is very important. It also should be specific – it is a fundamental belief. Don’t listen to rumors and believe in beliefs. You have to ask expert in this field if you have confusion. If you are familiar driving a particular counterbalance forklift and you want to drive other types of trucks, you have to go through conversion course. It only takes lesser time, about 2-3 days to complete it. This time will allow you to learn the very important aspects of the forklift and how it feels to drive one in real job scenario. Take some time to advance your skill, convert your counterbalance licence to other types of licence so you will be able to drive reach trucks and other counterbalance trucks.